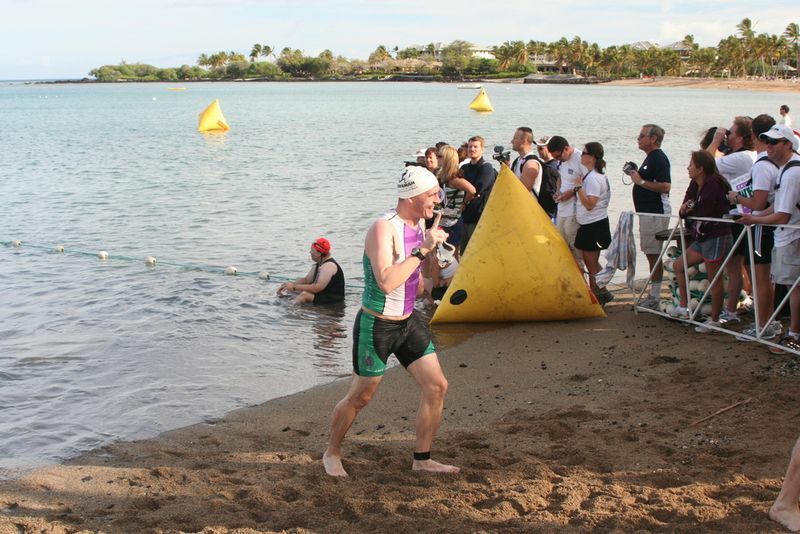 March 29th 2009, Kona, Hawaii…Lavaman had arrived, it was time to race! Kerry and I arrived in Hawaii with the TNT crew on the Friday and settled into our hotel and picked up our bikes. On Saturday it was an early start to see Dave Scott (6 time Ironman World Champion) provide some sagely advice for race day, then off for a practice swim, bike and run. And then it was Sunday, up at 5:00am, quick bite to eat and cup of tea and then off to the hotel lobby for the 5:45am meet up. From there we all headed down to the transition area to set up our kit, get marked with our race numbers and pickup our timing chips. 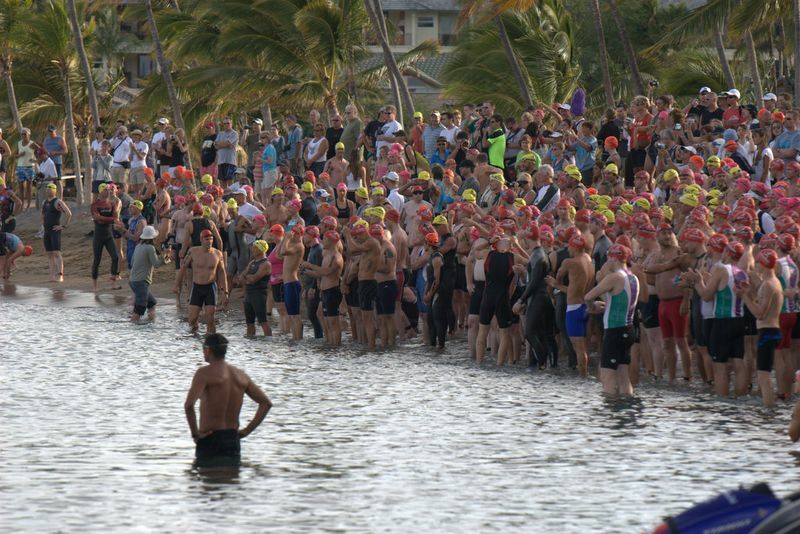 At 7:00am everyone gathered at the start, or went for a warm up swim, come 7:15am the tension was building as the first wave of pros got ready to go at 7:30am, 3 minutes after that I’d be off and after 9 minutes Kerry would be following. 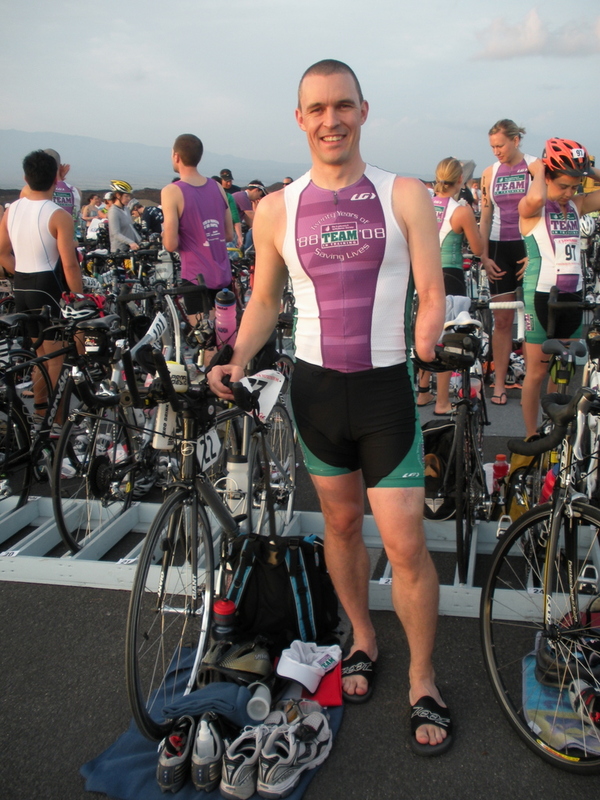 7:33am and I the race was on, 7:34am and my right arm was dislocated…as I reached forward with my hand someone must have been kicking backwards and kicked my shoulder out of its socket. So there I am, no left hand, can’t use my right arm, just kicking to stay afloat. I waved my stump at the safety support dude on his surf board, unfortunately since all I could wave was my stump he just stood on his board staring at me blankly. So I had to kick myself over to him, rest my head on his board, relax my shoulder and pop it back in, then on with the race! All-in-all it probably cost me 2 minutes, but at least I wasn’t out of the race. 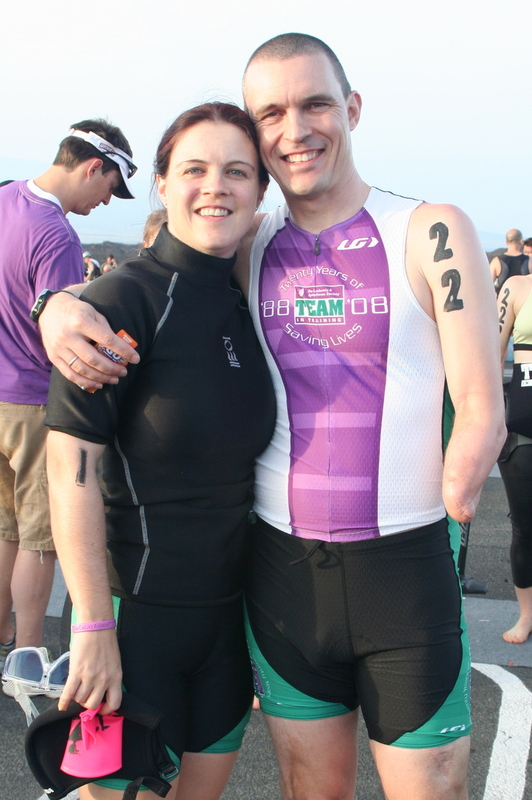 Since I’m slower than most on the swim and the subsequent waves started only 3 minutes apart I had the pleasure of having the next 3 waves catch up with me and literally swim over the top of me…even the women, man they don’t take prisoners! 45 minutes later and the swim was over. 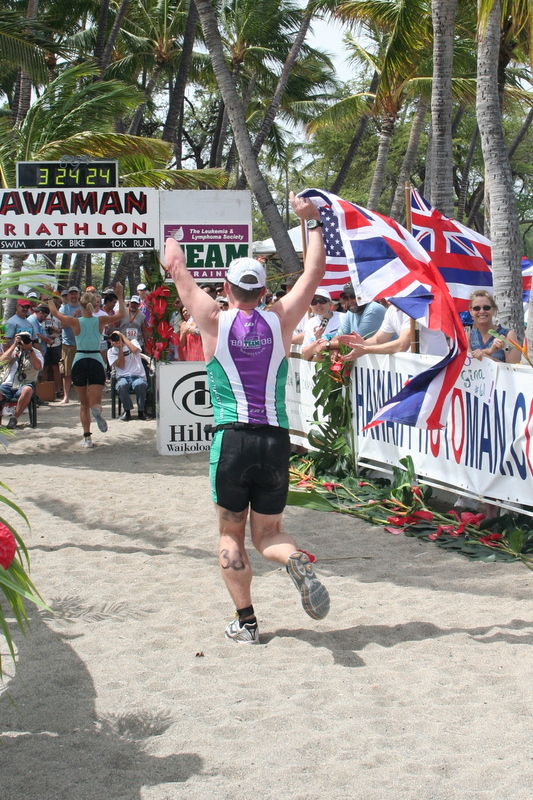 A short jog up the beach to the transition area and it was time for the 40km bike ride along Queen K (the main road of Ironman course fame). 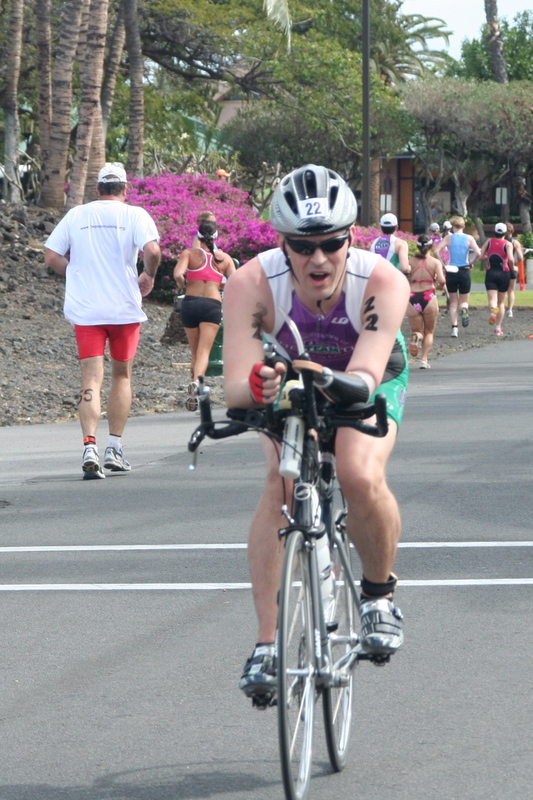 Despite my slow time on the swim I was able to make up time on the bike, passing many people during the ride. The last 6 miles or so were into a 15-20mph headwind, even though I was going down hill it was like peddling up hill! I was glad to be heading back to the transition area after about a 1 hr 30 mins ride. Last leg left, 10km run…definitely not my favorite part. 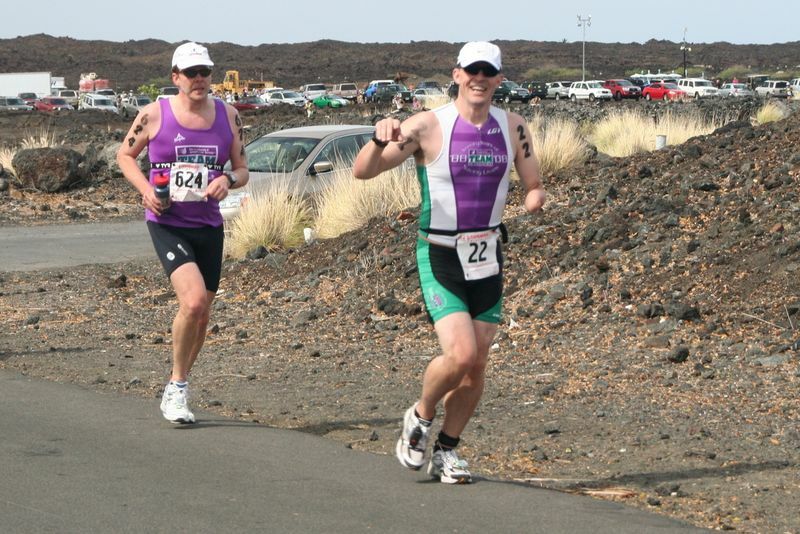 The first 1/2 mile of the run was across a lava field, uphill and into the headwind, what a start. At several points during the run I was heading uphill into that same headwind and the last mile or so of the course was along a single track path through lava fields, coral and finally a sandy beach. I have to admit, I had to walk parts of the course, a combination of the heat and wind just wore me out, but I was determined to finish and just over an hour later the finish line was in sight. My total time was 3 hours 21 minutes, a few minutes faster than my tri at Pacific Grove, which considering the conditions wasn’t too bad really. 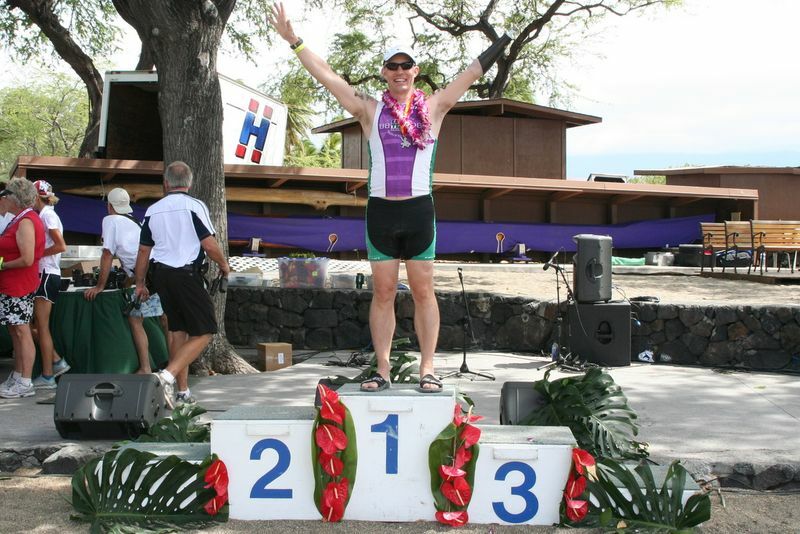 The fun part was yet to come though, I had no idea, but, as we watched the awards ceremony I heard my own name, I wondered what on earth was going on…apparently I was first in my class, so I got to stand up on the podium and accept my prize in front of all these great triathletes. It was a bit lonely up there mind you, since I was actually the only one in my class, but hell I’ll take all the awards I can get. I’ll be working on my technique this season as I’m training for a half, I’d love to get my 1.5km down to 30mins.